What is Malunggay and what can it do for me? Weird name, cool properties. Why Malunggay may be the breastfeeding supplement you don't hate taking. The best thing about Malunggay, in addition to it's status as a known galactagogue, is that it's a super-nutritious food that everyone should probably be taking. The second best thing about it is that it lacks the strong odour that fenugreek bears, which can cause mom's sweat, and baby's urine, to take on a "Maple Syrupy" scent. 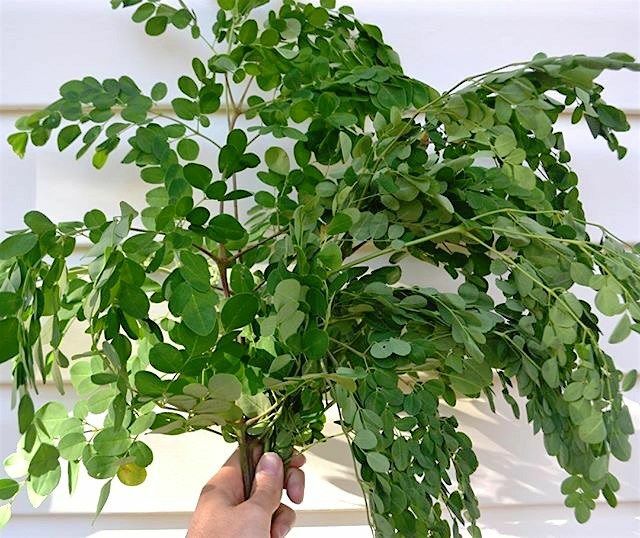 Malunggay (also known as Moringa) packs a serious nutritional punch, which has been known to people primarily in the Philippines, India, and China for generations. Malunggay is now used to fortify processed starchy foods (like noodles, for example) in countries where daily requirements of micronutrients are not easily met in the average person's diet. It's been a salvation to many in times of famine, and a welcome supplement in times of plenty for hundreds of years. It's traditionally consumed by pregnant women, breastfeeding mothers, and children, but more generally as well, by anyone seeking an aid to promote overall good health. The leaves, roots, and seedpods (resembling green beans) of the tree are edible. The roots have a pungent flavour comparable to horseradish. Don't worry if you don't like horseradish, however: the capsules we sell are made from the mild leaves of the tree. It can be taken from the 37th week of pregnancy to get a head start on your breastfeeding preparation, and is not contraindicated for use with More Milk Plus (containing fenugreek and other common natural galactagogues) or Domperidone.